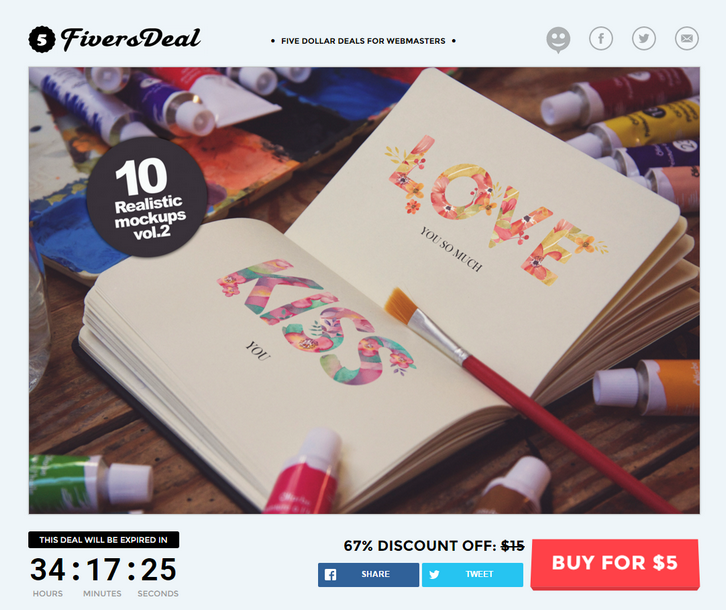 FiversDeal is a deal site that promote creative products for the price of $5 for a very short period (usually 48 hours). Here we have 10 Professional photo shoot mock-Ups in high resolution this week. This Art Equipment Mockups is great to present your art, sketch, illustration, etc in photo-realistic appearances. Available in layered Photoshop format and it’s easy to use, thanks to smart objects feature. This mockups also comes up with 3 final filter that you can chose to fit your style. Photorealistic Result. High Definition. Easy Change of Design. 3 Final Effects. Great Perspectives. Organized Layers and Folders. You can also subscribe to get more fiver dollar deals.